That was how Neil Chayet (HLS 63’) began each of the more than 10,000 recordings he made for his radio program “Looking at the Law,” which he recorded almost daily from 1976 to 2017. The Harvard Law School Library is pleased to announce that nearly all of these episodes are now available online and open for use. 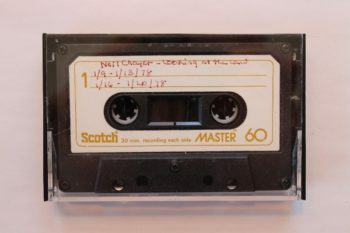 The Neil Chayet collection of audio and transcripts from “Looking at the Law” allows users to listen to the shows, as well as read the transcripts. In one or two minute segments Chayet would summarize court cases from around the country. He tended to be more interested in obscure or quirky cases rather than those more widely known. It was likely his ability to make any case accessible to a general listener combined with a good sense of humor that resulted in the shows enduring popularity. Want to learn more about Cohen v. Minneapolis Star, et al? Take a look at HLS alumnus Elliot C. Rothenberg’s case files from Cohen v. Cowles Media Company collection. Rothenberg represented Cohen from February 1986 until it was heard by the Supreme Court in March 1991. Digitization of the original cassettes is ongoing. Audio for shows broadcast between 1976 and 1995 are available now, as are digitized transcripts from 1975 to 1989. The entire collection should be available by early summer 2019. Please direct any question to Historical & Special Collections. What do dining halls, women’s showers at Hemenway, and shared course outlines have in common? These are all resources available at Harvard Law School today that were put into place by students of yesterday. Photograph of a Students for a Democratic Society (SDS) national meeting that was held in the Ames Courtoom on the HLS campus. March 1972; Unknown photographer. Following an archival collecting project undertaken by Historical & Special Collections in 2016-2018, the exhibit also addresses how archivists here at HLS and abroad are coordinating efforts to preserve today’s student histories. This exhibit was curated by Jessica Farrell and Jane Kelly of Historical & Special Collections. It will be on view in the Caspersen Room through January 2019 with online addenda at bit.ly/HSCexhibit. This is the fourth in a series of five blogs about Historical & Special Collections’ English Manor Rolls (1305-1770). HSC was honored to have Eleanor Goerss, Pforzheimer Fellow ’17, with us to perform research on and enhance description of this internationally-important collection, including authoring these posts. (clockwise) Folder 10, Membrane B. Moulton (Multon), Norfolk; Folder 162, Membranes D, E, and O, Great Wishford, Wiltshire. In the manor court, an inquest jury would be convened to gather evidence and pronounce judgment on a specific dispute. On occasion, they would refer back to the court rolls to find this evidence. Jury members or scribes drew pointing hands (sometimes called manicula or manicules) to note the cases under examination. With a little bit of flair, the hands give a sense of how the rolls were handled, unfurled, searched, and marked beyond the initial court session that they record. Sherman, William H. “Toward a History of the Manicule” in Used Books Marking Readers in Renaissance England. Philadelphia: University of Pennsylvania Press, 2009. The Harvard Law School Library is excited to announce that it recently received a unique collection of material from the family of Harvard Law School (HLS) alumnus, jurist, and popular radio personality Neil Chayet (HLS ’63). Comprised of more than 10,000 individual transcripts and several thousand corresponding minute-long radio broadcast recordings, the collection represents almost the entirety of Neil Chayet’s “Looking at the Law” radio program which aired on various Boston and national radio stations from 1976-2017. A native of Massachusetts and the son of a district court judge, Neil Chayet received his bachelor’s degree from Tufts University and his J.D. from HLS in 1963. His legal career focused primarily on medical law, and included work on several high-profile cases, including serving on the psychiatric task force for the Boston Strangler murders investigation, and as a lawyer representing inmates at Bridgewater State Hospital in the late 1960s. Chayet went on to become a faculty member of both the Harvard Medical School and the Cummings School of Veterinary Medicine at Tufts. The collection of material that HLS received includes the typed transcripts of nearly every episode of “Looking at the Law” (more than 10,000 in total), roughly 240 audiovisual objects (cassette tapes, CDs, DAT tapes, etc.) containing recordings of several thousand “Looking at the Law” episodes, and many gigabytes of born digital material (later episodes). The goal is to provide researchers with robust digital access to this collection, something HLS staff members are working diligently to accomplish. We are currently preparing the paper material for digitization, the end-result of which will be viewing and full-text search capabilities for each typed transcript/episode online. The majority of the typed transcripts also include a citation to the legal case featured in that episode (you can see a citation toward the bottom of the transcript shown above). By collaborating with the Caselaw Access Project at HLS, we hope to provide links and/or other contextual metadata about the actual cases as well. The next phase of the project will involve digitizing the audiovisual recordings and creating links between the digitized transcripts for each episode and the related audio recording. Ultimately, the collection will be accessible to users via HOLLIS for Archival Discovery, as well as other possible locations. So, “stay tuned” for future a future update about the project, including when the collection will be open to the public. Historical & Special Collections (HSC) has been working hard since the spring of 2016 to collect material that helps tell the story of student life at Harvard Law School (HLS), most recently in the form of the HLS Community Capture Project. Given our focus on archiving student action, it was very exciting to find a nondescript, cardboard box tucked away in the Library’s art office, contained objects from a student protest in 1987. On the front of the box scribbled in pencil were notes made by Bernice Loss, the School’s first art curator. Loss, a trained artist (and spouse of HLS faculty member Louis Loss) started to look after the School’s art collection in the early 1970s. In 1977, she was named the first HLS art director, later becoming the curator of the art collection and a member of the Library’s Special Collections Department (created in 1985). Loss’ inscription reads: 1987 / Paper Plate Faces / (To protest too many male faces in collection). Inside are more than 50 papers plates with images and slogans written in marker meant to highlight the larger number of white, male portraits and the lack of women and professors of color. According to Loss’ notes, these plates were placed in the hallways of Austin Hall, on books in the Austin Hall north classroom; on the frames of pictures in Langdell Hall; as well as a few other locations on campus. A sign and examples of the paper plates recently rediscovered. During her tenure, Loss worked to diversify the portrait collection, overseeing the acquisition of portraits of women and people of color including Judge Ruth Abrams (LL.B. 1956), Florence Allen, Clarence Clyde Ferguson, and George Lewis Ruffin (LL.B. 1869). However, then as now, the collection was predominantly made up of portraits of white men. Like the notes students placed “beside portraits of black faculty, expressing appreciation for their pedagogy, scholarship, and character” in response to the vandalism of photographs of Black faculty members (and later archived by HSC), these paper plates are extremely ephemeral, making it all the more exciting that they have survived more than 30 years. They also raise interesting questions regarding their storage and preservation, as well as the ethics of collecting student protest material. Did students consider what would happen to the plates after they put them up? Were they involved in the transfer of material to the Library? How does one care for paper objects that are more 3-D than flat? The plates and their accompanying material will now be formally accessioned and made available to anyone who would like to see them. If you were a student involved in this protest, we would love to hear from you and learn more about this action and how the HLS community responded. This is the third in a series of five blogs about Historical & Special Collections’ English Manor Rolls (1305-1770). HSC was honored to have Eleanor Goerss, Pforzheimer Fellow ’17, with us last summer to perform research on and enhance description of this internationally-important collection, including authoring these posts. Stay tuned for more of what you’ll find, often unexpectedly, in this collection. 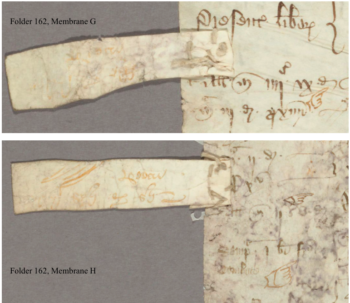 Here’s what a fourteenth-century English feud looks like, pieced together from court manor records. Warning: it involves blood. The first entry in the section of the roll pictured above says that Gonne Brighamton, “unjustly and against the peace, drew blood from Margaret Conperes” [Gonne Brighamton iniuste et contra pacem traxit sanguinem de Margareta] and was fined four pence for it. In the next entry Walter Conperes and his wife Margaret bring a complaint against Gonne Brighamton for trespassing, saying that “she assaulted the said Margaret, who was beaten and badly handled against the peace, to damages of 50 s.” Gonne was fined three pence. But we quickly learn that Margaret was not exactly a passive victim. The next two entries say: first, Margaret drew blood from the Gonne, and second that Margaret was fined for trespassing against Gonne, beating her and handling her badly, also for damages of 50 shillings. In other words, Margaret and Gonne settled their bloody fight in court, loudly letting everyone know about it while also paying out a total of fourteen pence to the lord. An out-of-court settlement would have been much cheaper; in fourteenth-century Wiltshire the going rate for a “license of concord,” or permission to let charges drop, was only two pence!